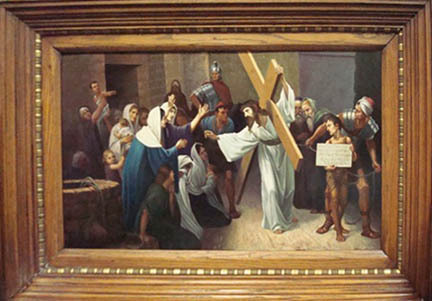 Description: One painting, oil on copper, depicting the eighth station of the cross in which Jesus meets Jerusalem women who weep for him, housed in a dark oak decorative frame. Additional Information: Oils on copper offer incredibly rich detail by using the color, reflectiveness, and luminosity of the copper as an integral part of the palette. The process of treating the copper and successfully painting on this media has been guarded by the artists that historically utilized this technique, making oils on copper highly valuable and rare.